Public Address Systems have become a need at any event. Be it a wedding reception, private party, graduation or a business product launch, we at Azul Reception Hall offer you a the best of sound systems including QSC speakers and shure wireless microphones. With our sound system you can successfully host a live event or entertain your guests with the exact song list you provide the DJ. 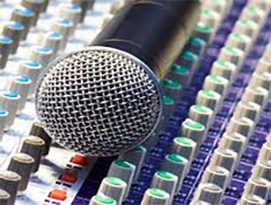 Let us know your sound needs and our team will make all the arrangements in the venue as per your plan. We allow you to concentrate on the event and leave the technical issues up to us.